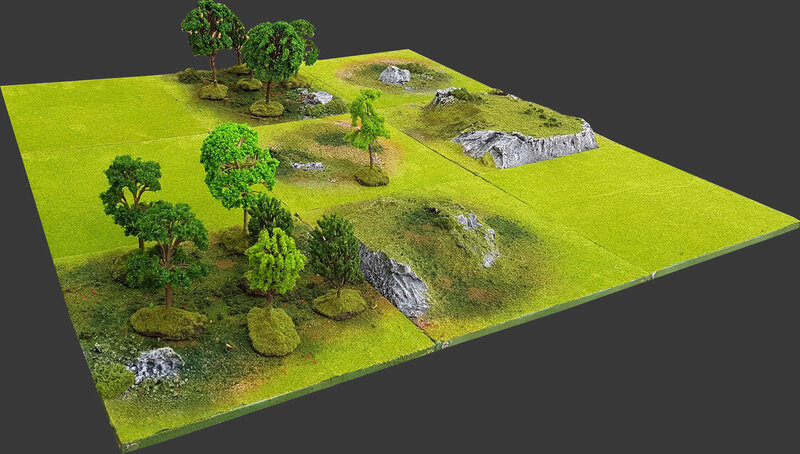 This set consists of 9 handpainted "Green Spring"-themed terrain Tiles. These 30cm x 30cm (1'x1') Tiles connect magnetically and can be configured to create any science fiction (or historical) board. You can arrange (and expand) them to simulate multiple battlefield layouts to fit any size of playing area, to suit each of your games. And, since they take up minimal space, you can store them in a small living-room cupboard. The "Yavin 4" set is designed to accommodate Star Wars Legion skirmishes set in temperate, lightly forested planets. The Set can be augmented with 1 Impact Crater tile (it substitutes 1 "plain ground" tile) to add more variation to the battlefield and a sc-fi feel (see gallery images). Also, you can add some extra resin Rock formations to place anywhere on the board. Not in stock - this is the pre-order the Pedion "Yavin 4" 3'x3' Winter Battlefield Set. to be hand crafted and painted to fit your order. See estimated delivery time. Each Tile is 30cm x 30cm (1' x 1') and 1cm deep; the majority are made from polystyrene and PVC, with Resin extra pieces.